This is a dish that’s both healthy and reminiscent of comfort food. You can use any type of bean or legume in this recipe (I used navy beans that I had soaked and cooked the day before) and flavor with any kind of spice—I chose smoked paprika to enhance the flavor of the raw ketchup. Chop the onion, carrot, and scallions into small pieces. Warm a small pot on the stove, and pour in the olive oil. When it's hot, add the onion and carrot. Sauté the vegetables for about five minutes, until they are soft, and then add the scallions. Cook for another minute or two, stirring occasionally. Add the cooked beans and paprika. If the mixture is too thick, dilute it with water. Continue cooking until the mixture is evenly combined and everything is warm. Take the beans off the heat, and stir in the ketchup. 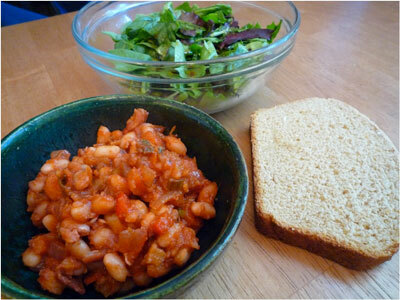 Serve the beans with a fresh green salad and toast, brown rice, or another whole grain.